I’ve read Diana M. Raab’s soft cover poetry book a few evenings now. I think it’s hard to say anything about the poetry itself, because poetry is so personal and sometimes even mystifying. Reviewing it is difficult. I like some of the poems as they make me smile, others I don’t even understand and some I don’t like at all. What I do love most about this book, in addition to the beautiful cover, is the thought behind the book; the idea of writing poetry in your diary and/or writing a biography like this one using only poems. It’s awesome. As poetry is so personal I think journal or diary poetry is a great idea. I like that the whole book is dedicated to Anaïs Nin, who wrote diaries her whole life. They are all published and it’s my plan to start reading them this year. 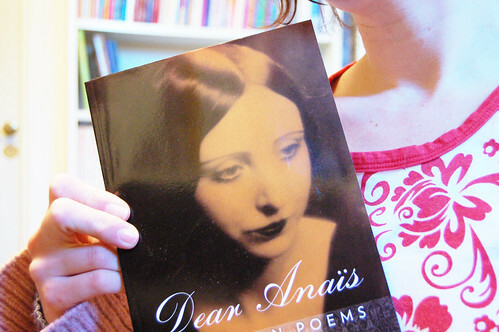 I also like the beautiful title; Dear Anaïs: My Life in Poems For You. If you are interested in self-biography poetry I think you should check this book out. I’m still reading Wayne Dyer’s book, but I jumping between lots of books right now. Last night I finished a Swedish novel and I’m also reading Virginia Woolf’s diary. My plan is to read a couple of writer’s diaries this year. Anaïs Nin, Woolf and Simone de Beauvoir! I listened to a new podcast about journal writing yesterday. It’s Wendy Hale Davis talking about Journaling, interviewed by her friend the very cool and artsy writer Ricë Freeman-Zachery of the blog Notes from the Voodoo Cafe. If you listen and like this you need to go tell Ricë to continue to do podcasts about art and journaling for us. The podcasts talks about naming your journals, how to get started writing and what journal keeping can do for you. I think Wendy had a lot of interesting stuff to say, so I wished it would’ve been longer! Ricë also wrote a book, called Living the Creative Life: Ideas and Inspiration from Working Artists (I haven’t read it but it’s on my amazon wish list). I adore the videos she does, check them out at her youtube page! * And on journaling, my blog friend Sama is always digging up interesting images and articles on journaling, sketching, Moleskines etc. * Regina’s Closet: Finding My Grandmother’s Secret Journal is another book by Diane Raab that is about a diary. A diary Diana’s grandmother wrote during her life. * Check out the blog Diana’s Notebook – about diary writing. Wanna try out Diary Poetry? You could write about your beautiful body or what you like or don’t like about it. You could write a poem. Or describe the room you’re in; what do you see, where do you sit, what do you smell? Details from within – Schyyy, it’s private and I’m only sharing it with you! This entry was posted in Thoughts on Creativity and tagged diary writing, journaling, link love, poetry, reading. Bookmark the permalink. thanks so much for posting this! great to get new people to check out what wendy has to say about journaling. and just wait until you see what the give-away is next week–yowza! Hi Ricë! Glad you came by and visited my blog! I love giveaways, and podcasts and… lots of things that are free! :-) I love your blog lots! Thanks for linking to me! Wendy is just awesome. She lives here in Austin and I’ve learned most of what I know about book-binding from her. If you want to find examples of her journals, she’s in a bunch of books on journalling. I’ll look them up, as I think I have most of them in my library and send them to you. Anyway! I’m heading back to my studio so I can get to work on my dragon. I’ve read the diaries of Anais and Virginia. I loved them both. They are both so fascinating. I’m going to check out the blogs you talked about. I want Rice’s book so bad. I tried getting it from the library, but it’s not there yet. I always love coming here, Hanna. Hi Hanna! Thanks so much for sharing all this with me! It actually answers some questions I emailed you a little while ago. I am totally going to check out the podcast. I love biographical writing too – I have read some Anais Nin and Sylvia Plath is a real favourite of mine. This poetry book sounds really interesting. Thanks for sharing – need to check out the podcast. Growing up I found journaling to be the only way to express myself when things at home became too much to handle. To this day I still journal, and is the key act the main character in my novel “Writing in the Margins” does to cope with his changing life. If you’re looking for a good read about journaling and its affects check out my website. Later days, and thanks for the blog. this is awesome. i have so fallen off the journaling wagon and this might just be the thing to get me back on! thanks for sharing this. =) ps. i love your blog! long time reader, infrequent commenter. now that i have an rss reader thingie i’m definitely adding your blog to it! thanks for being awesome. You completely ROCK, Hanna. Thank you so much for these links and the podcast head’s up. I am having trouble with my journal, and I could use this inspiration! Your blog is such an inspiration – a minefield of clever tips and tricks, useful links and exploding with life and colour. I love it. Thanks for sharing this.